For those that haven't visited Seattle, don't let anyone fool you, it rains here. A lot. Yes, it's beautiful, yes, the sunny days make it "worth it," but when it rains, it pours. It can put a damper on creativity, activities and just productive tasks you need to get done. But I'm here to share the rainy day essentials with you: My Top 6 favorite things to do when it rains, my favorite indoor shoot locations for rainy days and of course, my rainy day inspired outfit. 1. Visit a local museum or gallery - my favorites are Seattle Art Museum, MoPop and the Frye Art Gallery. Even as a tourist, I save my rainy days to view a new gallery exhibit or revisit old favorites. Pro Tip: There tends to be discounted ticket prices on Groupon, try buying mid-week for weekend tickets. 2. Try out a new happy hour spot - a must in my book. I love exploring new neighborhoods and what better way to top off the day than with a cocktail? Whether it's a productive happy hour to discuss creative projects, network, or just celebrate that time of the day - it makes rainy days less painful. 3. Satisfy your green thumb - on rainy days, I love to visit the Volunteer Park Conservatory. There is something so beautiful seeing everything so lush and green and you're indoors! This is one of my favorite local spots to soak up the sights and photograph. 4. Play a round of mini golf, indoors - we don't have a lot of indoor group sporting options here in Seattle, but one that comes to mind that's always a blast is indoor putt putt golf at Flatstick Pub. There's a location in Pioneer Square and one opening downtown Seattle near South Lake Union. It's a great place to visit on rainy days for date night, team-building or when a group of friends can't seem to decide on what to do. 5. Consignment shopping! I swear this has become my new thing on rainy weekends. Seattle has so many consignment shops to choose from it can be a full day! It's the perfect rainy day activity whether you're just looking or looking to buy. My personal favorite is Ballard Consignment. 6. Paint some pottery - one of my favorite rainy day activities is to paint pottery. It's relaxing, fairly inexpensive (depending on what you paint) and fun! A local Ballard pottery studio that tends to be a fan favorite is: ANECDOTES. 1. Olympic Sculpture Park: PACCAR Building. It's bright, light and airy in here! I prefer shooting on the top floor (second floor) because it tends to be less crowded and has the best lighting. The entire building is indoors so it makes for a scenic backdrop and keeps you dry. There's also parking underneath the building which makes it even more convenient. Check hours as they vary in the winter and summer months. 2. Volunteer Park Conservatory. If you like lush, green plants or a desert cacti room as your backdrop, this is the place for you. I prefer this location for a quick in and out for content since there's no bathroom for easy changing and they tend to discourage professional photography in the space without a permit. Be respectful and aware of your surroundings while you're there and you shouldn't run into any issues. 3. Scenic foodie spots: Bar Melusine, General Porpoise and Frankie + Jo's. These are my favorite scenic foodie spots all located in Capitol Hill. They are light and airy spots with great backdrops. From Bar Melusine's flooring, vibrant chairs and marble counter tops to General Porpoise's jaw-dropping donuts, marble and pink aesthetic to Frankie + Jo's palm wallpaper wall, these are the places to snap a pic indoors. Be respectful of the establishment - don't just pop in to take a photo and split. Order a beverage and enjoy some oysters at Bar Melusine; get an order of donuts to go at GP and don't even think about leaving before trying out the latest vegan gelato flavor at Frankie + Jo's! 4. Outside the Seattle Public Library. A lot of people assume the outside of the Seattle Public Library is not under cover, but it is! In fact, the architecture creates a beautiful backdrop and it's great for "walking" blog photos. You also still get natural lighting pouring into your shots but won't be getting poured on when it's a rainy day. 5. Union Station + King Street Station. Both are close and excellent shoot spots! Each has their unique architecture, stairwells, flooring and lighting but it's totally up to your preference! These are go-to spots for rainy day blog shoots especially when you're capturing looks that are a bit more dressed up/elevated. 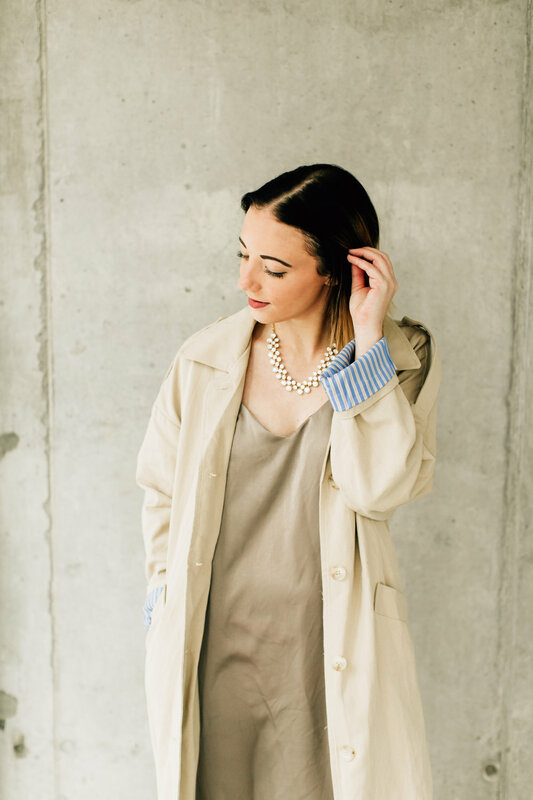 And, as promised, I'm sharing my rainy day inspired outfit revolving around my Ollie + Co. Pacific Rain trench coat, the name couldn't be more fitting right? Also, it's on sale! This was one of my favorite coats to style because of the fit, color and details! I've never owned a trench in my twenties and I think this is just the tip of the ice berg. They are a dream for rainy days! Granted, this trench coat doesn't have a hood but that's what umbrellas are for. And yes, despite being born and raised Pacific Northwest, your girl uses an umbrella. This trench hits right at my knee and comes in a beautiful khaki color. The silky striped blue detailing as seen on the cuffs of the sleeves is my favorite part - it makes the trench appear a bit more business casual but still on trend. The trench can be buttoned at the front or you can use the tie. I prefer keeping the trench open and creating a bow tie with the tie at the back. It is one of my favorite and easiest hacks when you don't feel like using the waist tie. I opted to keep my outfit fairly neutral but dressed up for when I'm on the go, at work or off to date night. My Moorea Seal slip dress in beige does the trick! This silky number is one of my favorites to layer up and wear (even in the winter)! Granted, my TopShop white studded block heels may not be the best rainy day shoe but they are great for all of those indoor activities I listed above! Not to mention, they were a steal of a deal: $50. My look is polished off with accessories: a feminine statement necklace from J. Crew Factory compliments my outfit and overall color palette keeping things neutral, trendy and comfortable for rainy day fun! Whether you're visiting Seattle or a local, try your best to embrace the rainy days with a stylish outfit, trying out a new indoor activity or visiting a photogenic gem in the heart of the city! What are your favorite ways to enjoy a rainy day here in the city? Thank you to Ollie + Co. for collaborating on this product sponsored blog post! To receive 15% off your order, use my code WESTCOAST at checkout. All thoughts and opinions expressed on West Coast Aesthetic are my own and every collaboration is done with absolute integrity.